There are several different types of eyelid tumors. Nevus and papilloma are the most common. Malignant eyelid tumors include basal cell carcinoma, sebaceous carcinoma, squamous cell carcinoma, and melanoma. 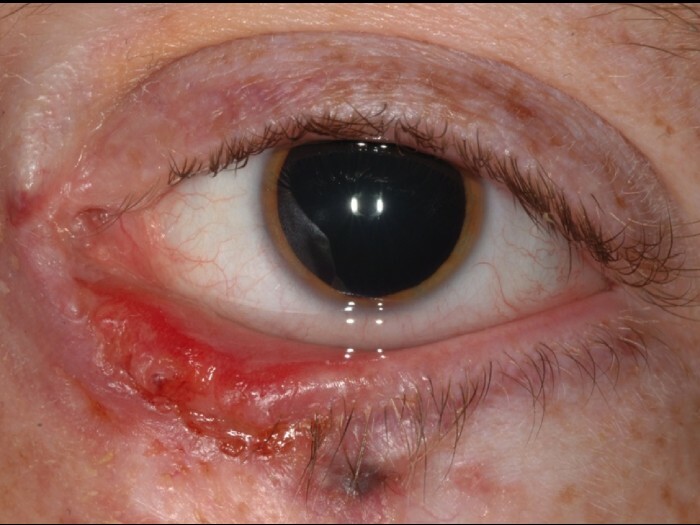 Benign pigmented or nonpigmented lesion on the eyelid or eyelid margin with rare tendency for malignant transformation. 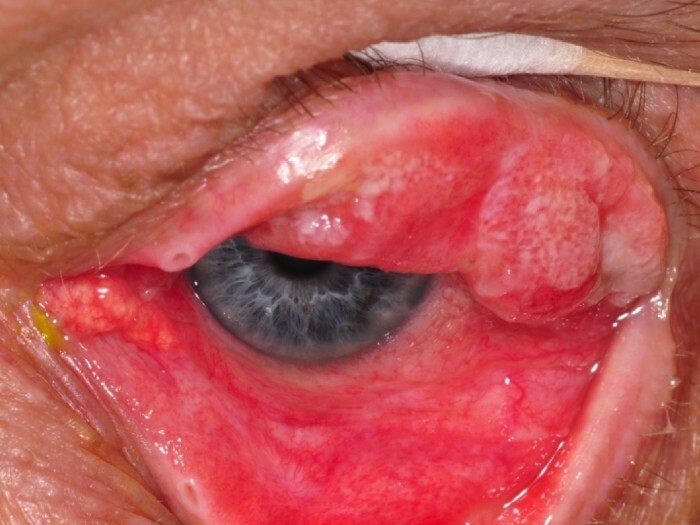 Benign, slowly evolving tumor of the eyelid mostly found in the elderly. Benign, inflammatory tumor of the sebaceous gland. Malignant tumor arising from the epidermis that can appear as a nodular, nodulo-ulcerative, or sclerosing lesion. Complete resection is important. 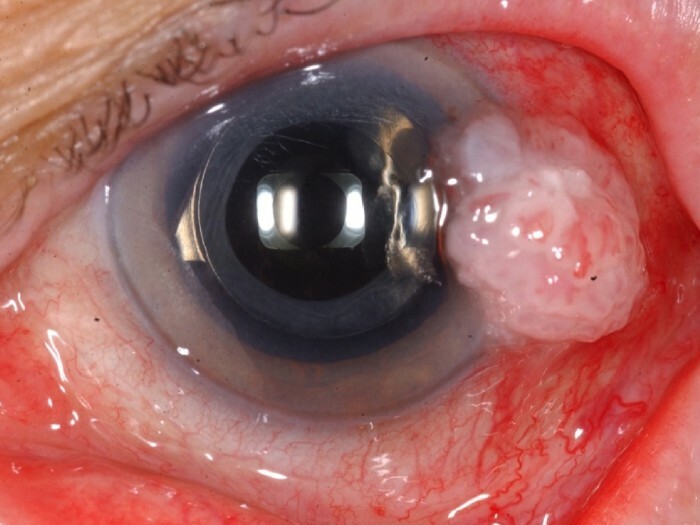 Malignant tumor arising from the sebaceous glands that can invade the surface of the eye and grow into the orbit. This tumor tends to arise in elderly women most often and has a greasy yellow color and loss of eyelashes. Complete resection is important. Malignant tumor of the epidermis in patients with heavy sun exposure. This can be treated surgically or with topical creams. 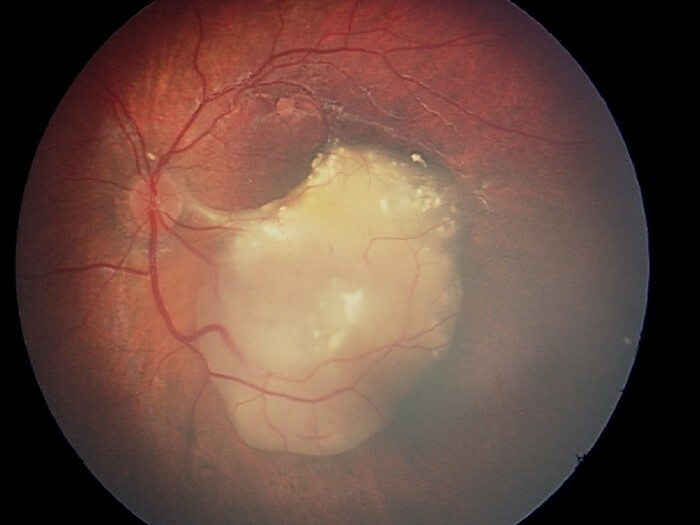 Benign degenerative tissue on the eye in the sun exposed regions that can look like an ocular surface tumor. 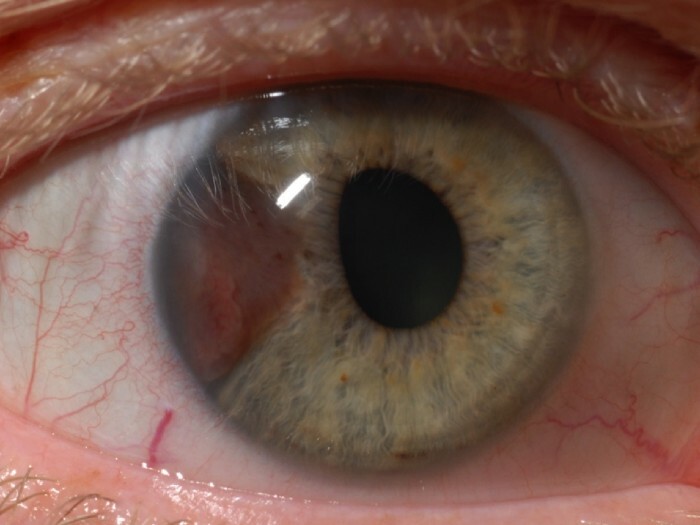 Benign tumor on the eye in which the conjunctival tissue overgrows onto the cornea. This can simulated squamous cell carcinoma. 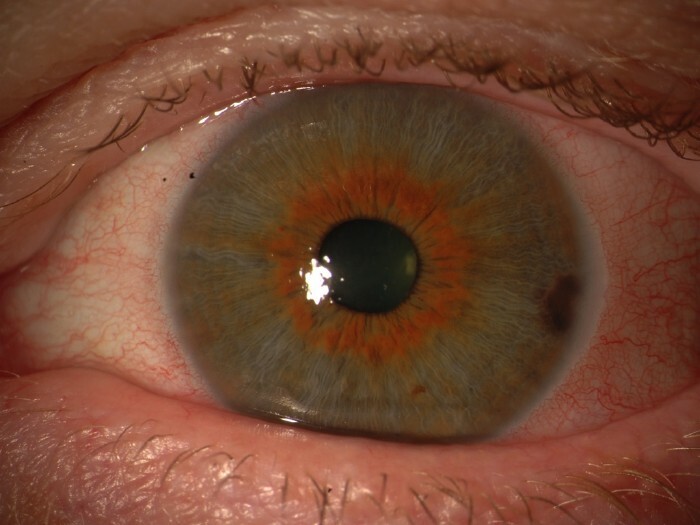 Benign pigmented or nonpigmented mass on the eye surface. 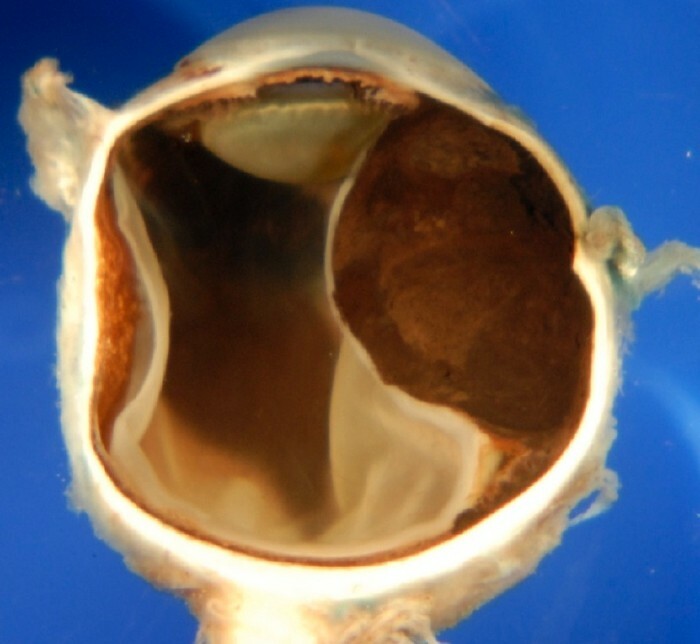 This is the most common tumor of the conjunctiva. Detection occurs in children and young adults. 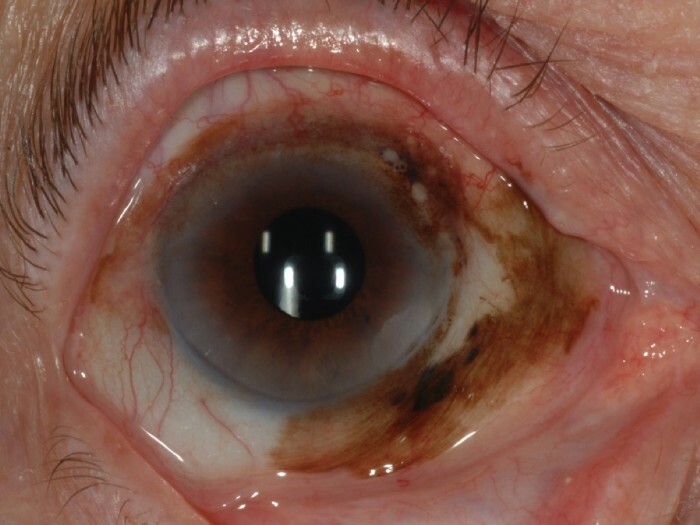 Prelmalignant pigmented condition causing brown discoloration of the ocular surface. This condition carries relatively high rate for transformation into melanoma. 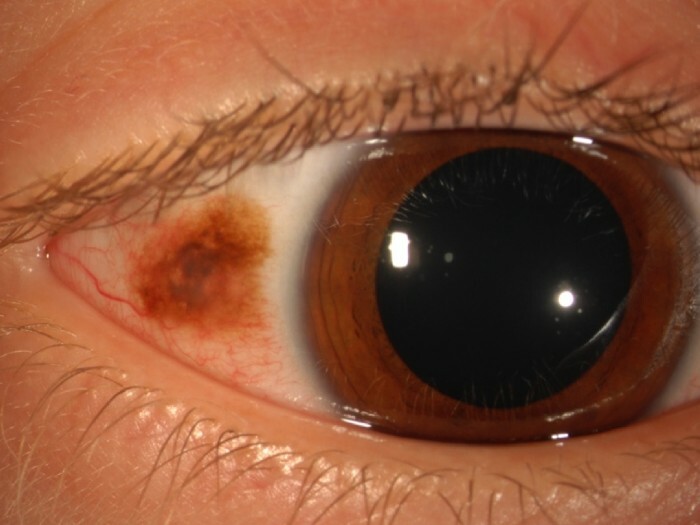 Malignant tumor of the conjunctiva that arises from long-standing nevus, primary acquired melanosis, or de novo. Early, complete resection is important. 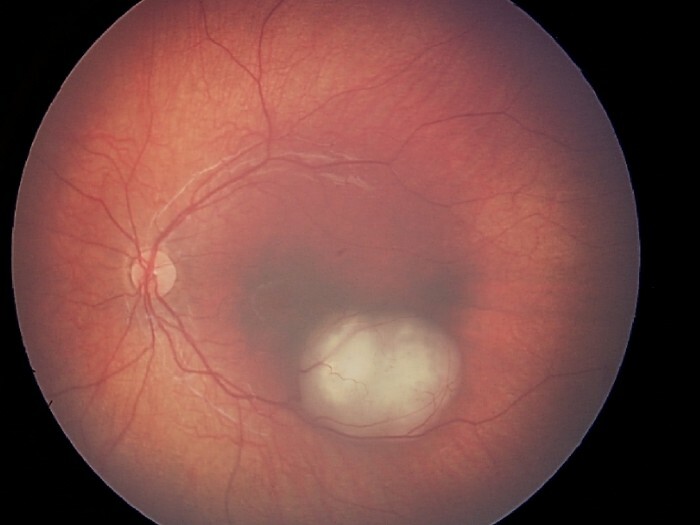 Malignant tumor appearing as a foamy, yellow-white vascular mass on the ocular surface. Treatment can be surgical or with eyedrops. Malignant tumor that can occur with systemic lymphoma. Tends to hide in the upper or lower quadrants deep behind the eyelids. 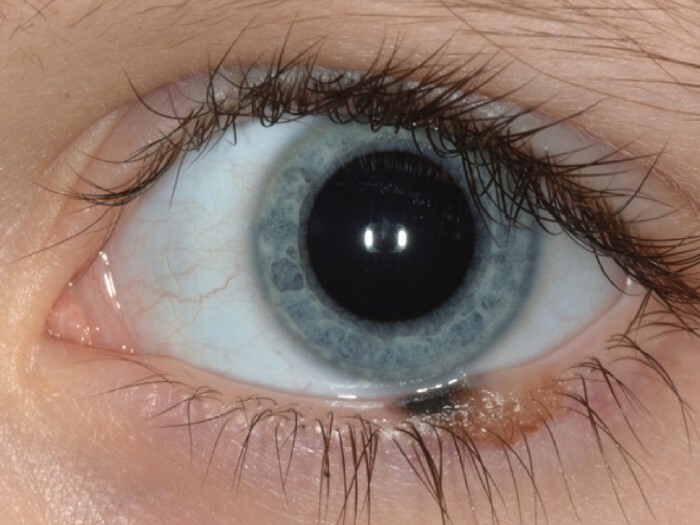 Benign condition that can occur in the iris stroma (front of iris) or iris pigment epithelium (back of iris). Some can be observed while others need surgical treatment. 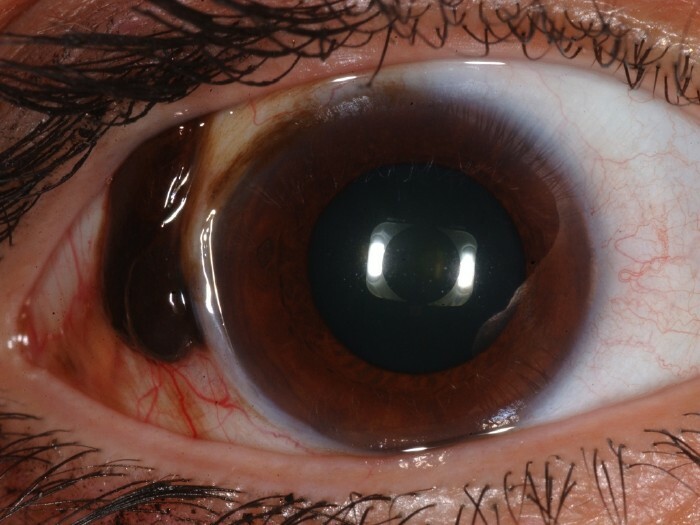 Benign tumor appearing as a brown or yellows spot on the iris stroma. Malignant tumor often detected when small size so prognosis is usually favorable. Benign tumor that classically remains stable. Can lead to reduced visual acuity. Can transform into melanoma. Malignant tumor with relatively high risk for metastasis. Classified into small, medium, or large sizes. Often treated with radiation or eye removal. 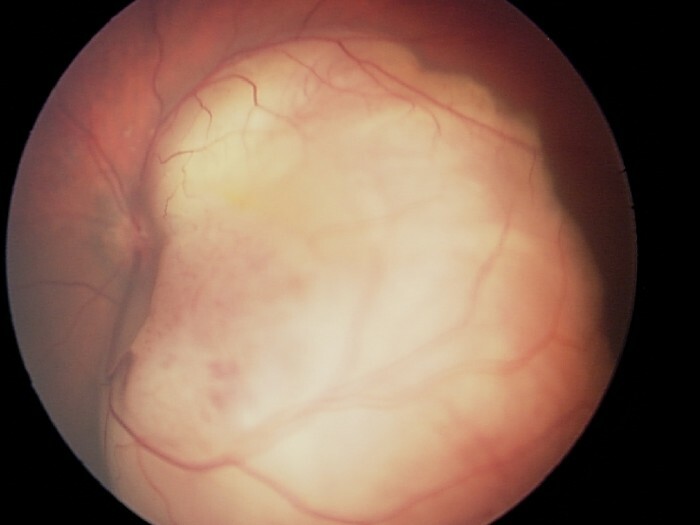 Benign tumor that can leak and result in poor vision. Malignant tumor that spread to the inner eye from remote site such as cancer of the breast or lung. Malignant tumor often associated with similar tumor in the abdomen. Conditions that simulate malignant melanoma. 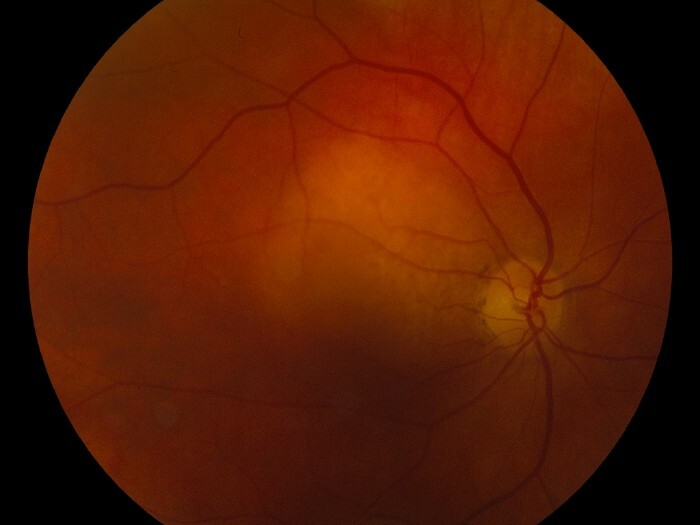 Hemorrhagic retinal disease of the elderly. 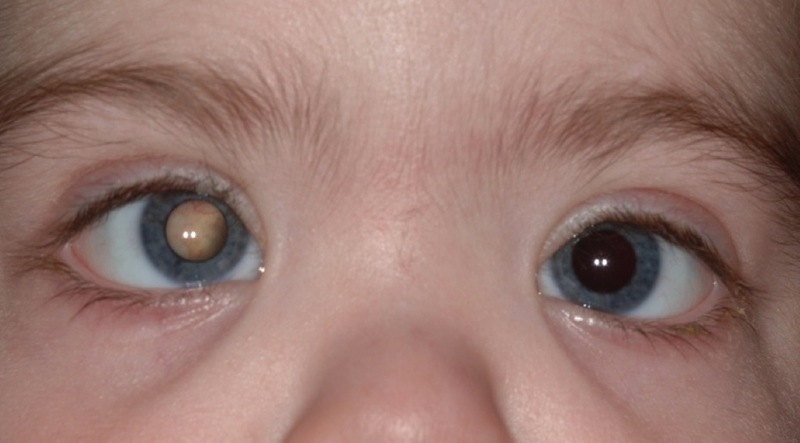 Clinical features- Most common presentation is with leukocoria (white pupil) or strabismus (crossed eye). 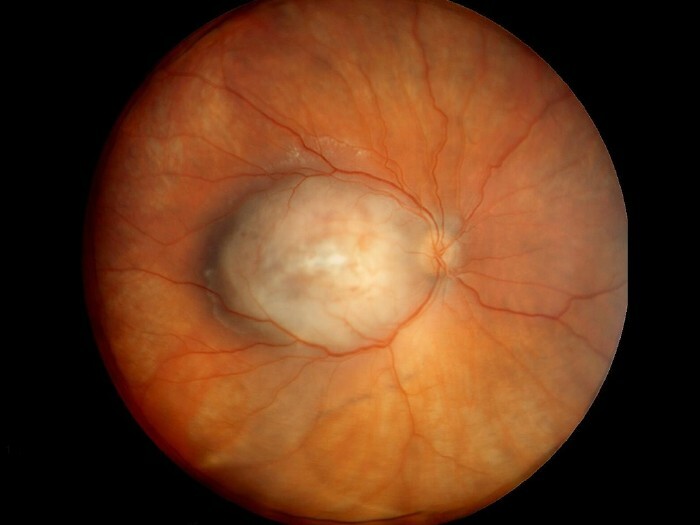 The tumor appears as a yellow-white mass in the retina of small , medium, or large size. 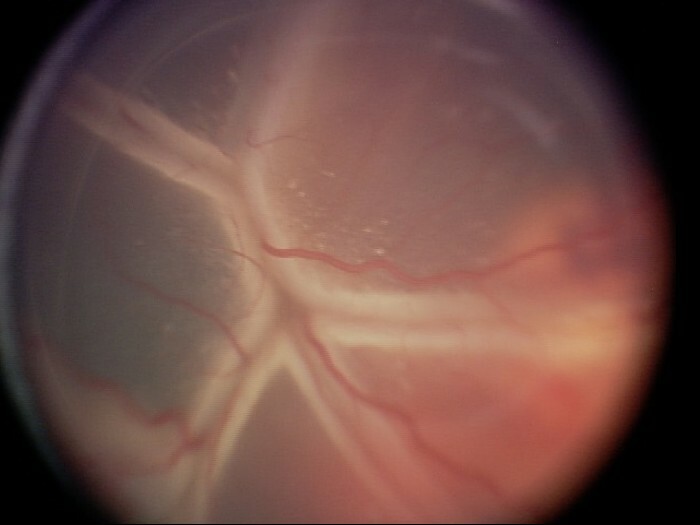 Often there is a large retinal detachment. Genetic testing – Performed on all children to investigate chromosome 13. 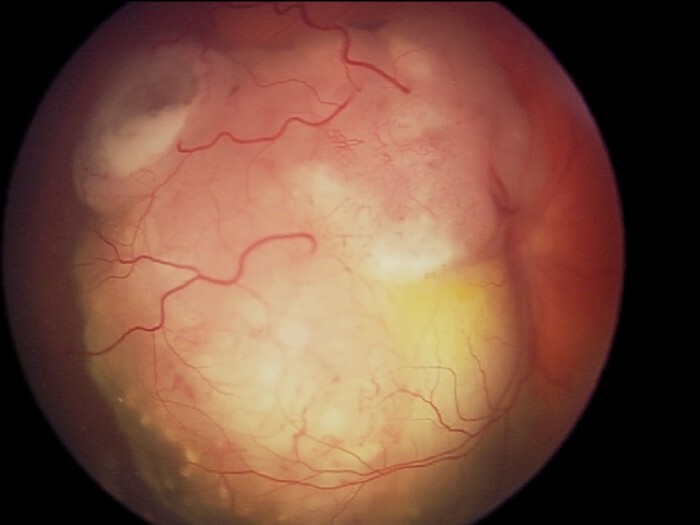 Benign retinal tumor, sometimes found with Tuberous Sclerosis Complex. 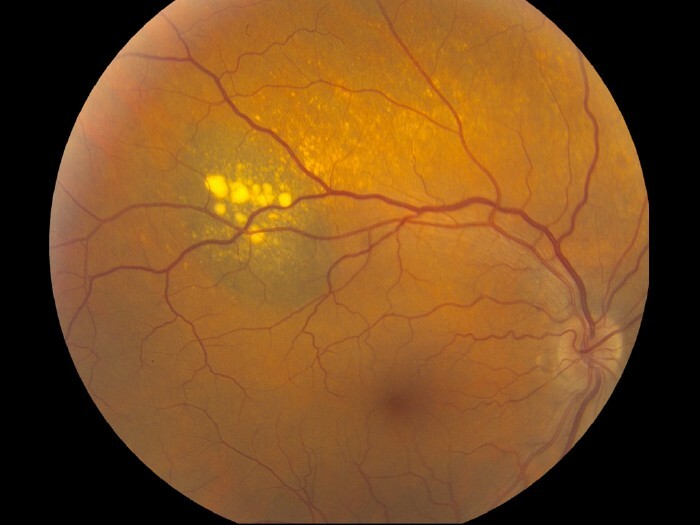 Benign vascular abnormality where the retinal vessels leak yellow exudation and fluid. Benign vascular condition with leakage and possible hereditary trait. Benign vascular tumor with leakage. Benign vascular tumor with leakage, and often associated with von Hippel Lindau disease. 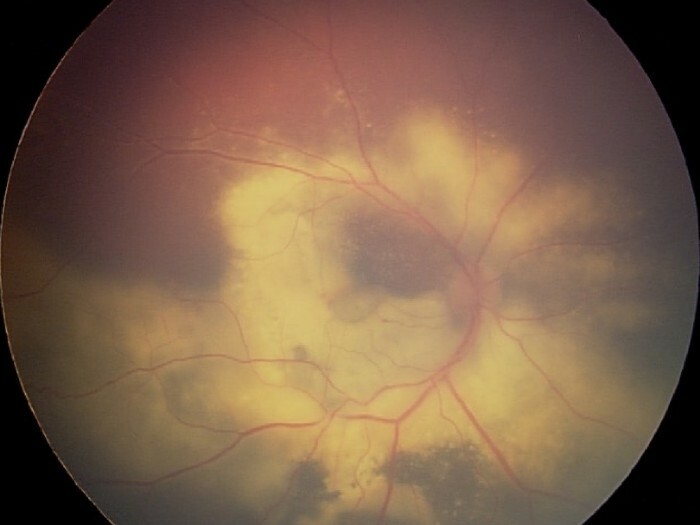 Malignant tumor of the retina and vitreous that can be associated with brain lymphoma. 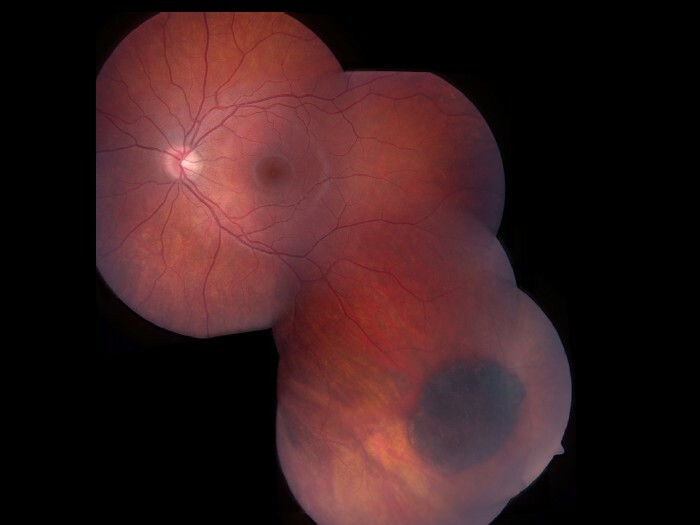 Congenital benign tumor that often leads to poor vision. Benign flat tumor often confused with nevus or melanoma. Rare tumor that is nodular, pigmented and slowly grows over many years. Benign chronic calcification of the eye wall. Benign inflammatory focus of the eye wall. Rapid onset inflammation and pain in the tissues around the eye. Responds to oral prednisone. Benign red skin tumor that has onset after birth and grows until about 6 months of age then undergoes slow spontaneous involution. Benign, often ill-defined, tumor of the lymphatics. Benign tumor with large cavernous spaces filled with blood. Benign tumor comprised of lymphocytes. Can achieve a large size before discovery. Mucosa associated lymphoid tissue (MALT) – Malignant low-grade tumor that can be associated with lymphoma in the abdomen. Can respond to surgical removal or systemic medications. Malignant tumors that spread to the orbit through the blood stream from remote sites like cancer of the breast, lung, or prostate. 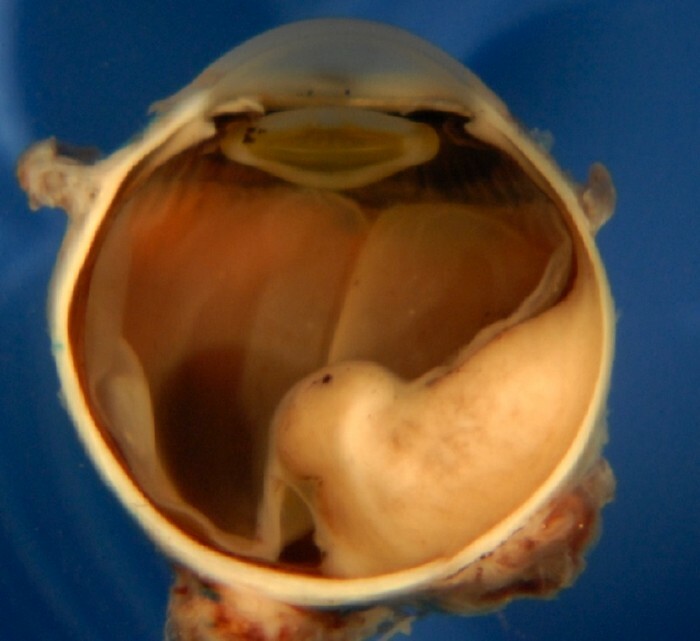 Benign tumor that arises from the lacrimal gland structures and remains localized to the orbit. Malignant tumor arising from the lacrimal gland with propensity to grow into surrounding tissue and spread to other organs. 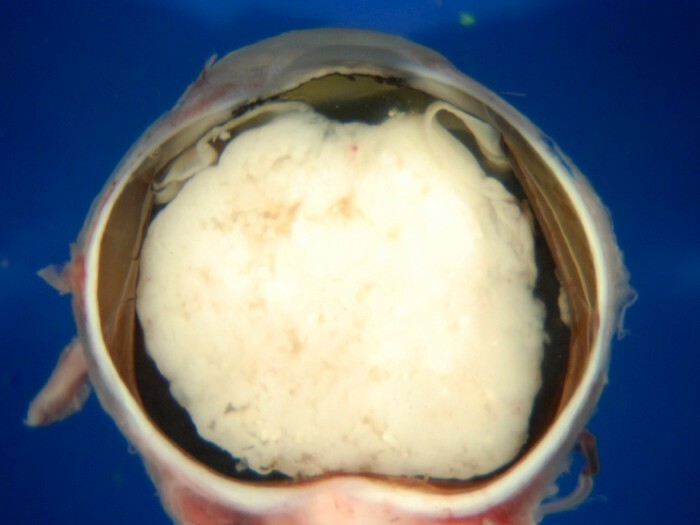 Globe filled with retinoblastoma appearing as a white mass. Globe filled with pigmented (brown) or nonpigmented (yellow) mass.